"After women, flowers are the most lovely thing God has given the world," Christian Dior once wrote. He was right. They are uplifting, chic, beautiful and inspiring, certainly in their natural habitats, and also in the hands of contemporary florists. Floristry has changed since Christian Dior's lifetime – now cities across the globe boast masters of different floristry styles. In a glorious new book, entitled Floral Contemporary: The Renaissance of Flower Design, author Olivier Dupon has collated 38 international florists who demonstrate, he says, "that real floral art is a serious endeavour, not merely 'puff and fluff' and not something to be stereotyped as "feminine". 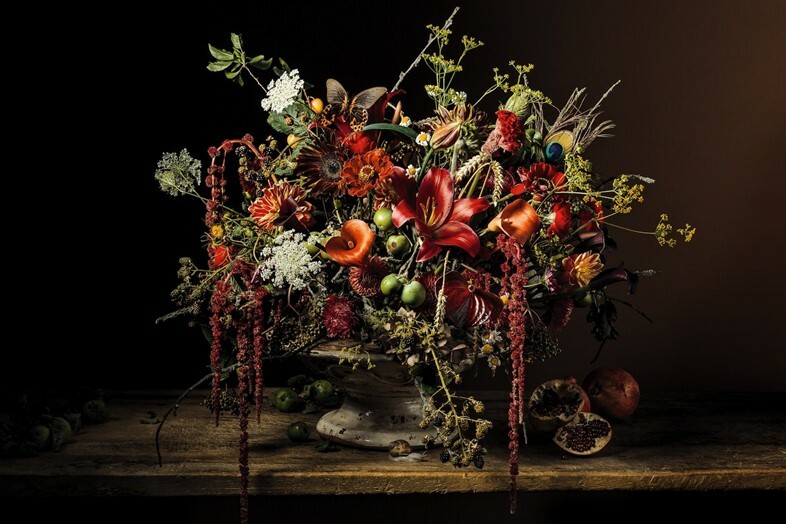 As well as over 300 beautiful visuals, Dupon also presents a number of interesting finds in the world of contemporary floristry: the fact that many florists are making an increasing effort to source their materials responsibly, and that there are key emerging trends from each of the territories. 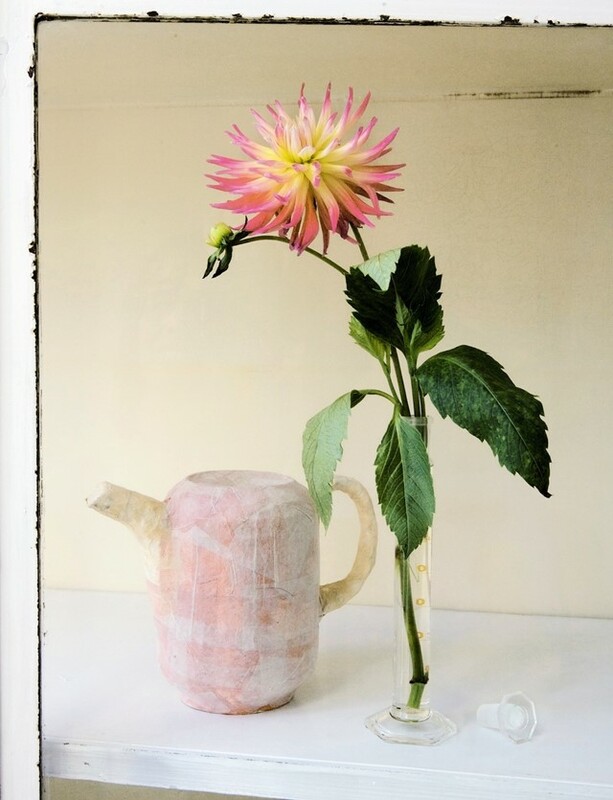 Clean structures from Japan; painterly, splayed still lifes from the USA; clever material juxtapositions and delicate simplicity from Denmark; loose and joyous blooms from the UK. Here, AnOther presents key favourites from the book, alongside commentary from the florists. "Poppies are the most cheerful of flowers. Sometimes you can't compete with them, so I wouldn't let them be on their own. 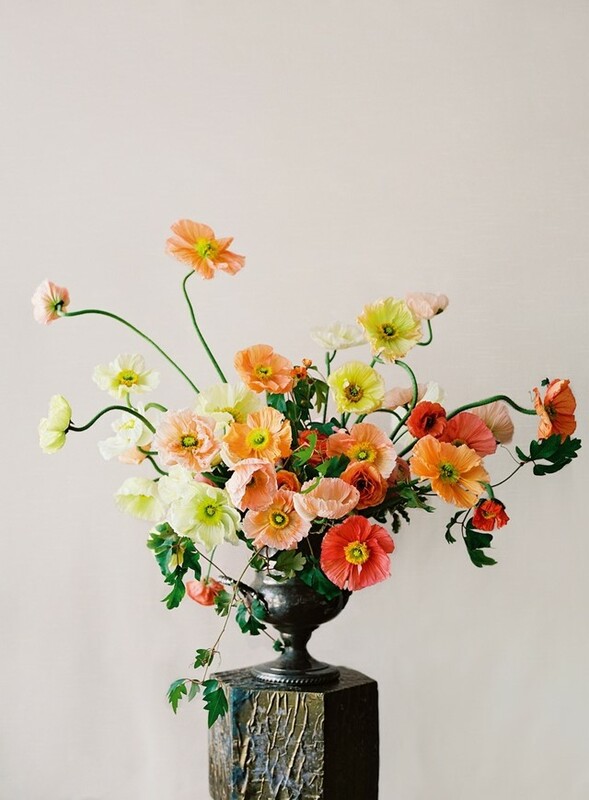 In this arrangement [above, top] palaver poppies from Italy are accented with grape ivy. I let them go wild in a vintage champagne bucket. 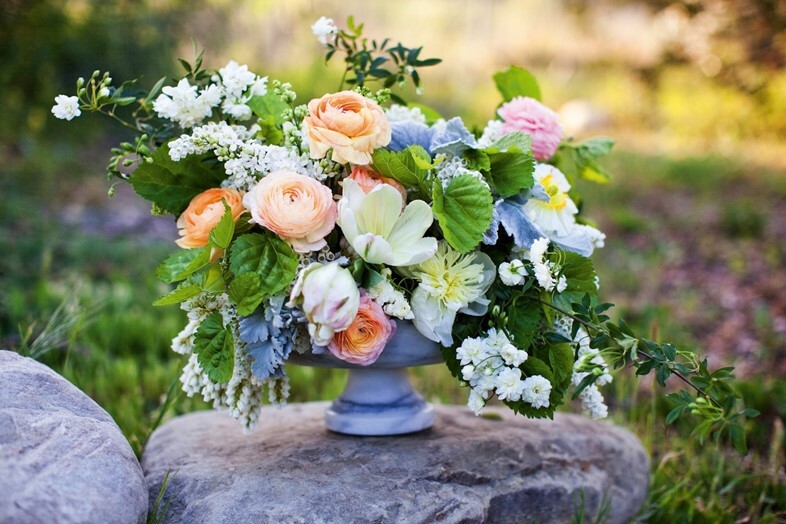 The second arrangment [above] includes ranunculus, Quicksand roses, jasmine vine, thistle and calcynia. The palette was inspired by the subtle variations in colour between all the focal flowers. The earthy cream and mauve tones gently fade from one tone to the next." "A crate filled with French tulips, guilder rose, hydrangeas, dahlias, spray roses and sweet peas. We try to use native flowers and to stay away from the exotic. 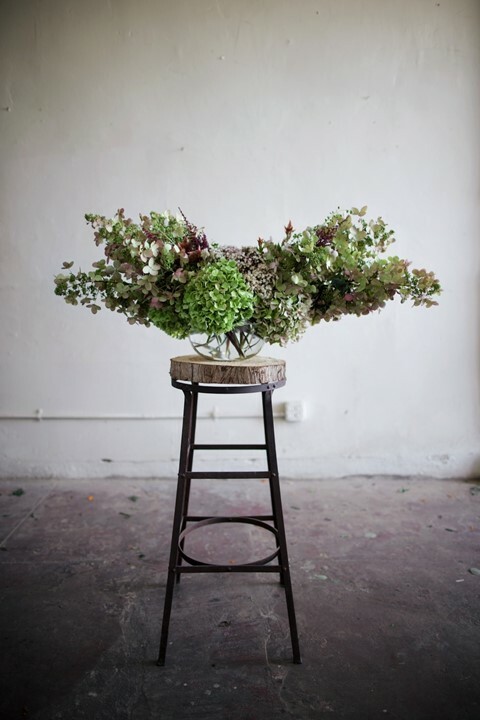 We definitely want to keep our arrangements as wild and natural as we can. For us, it's not about being neat or using symmetry." 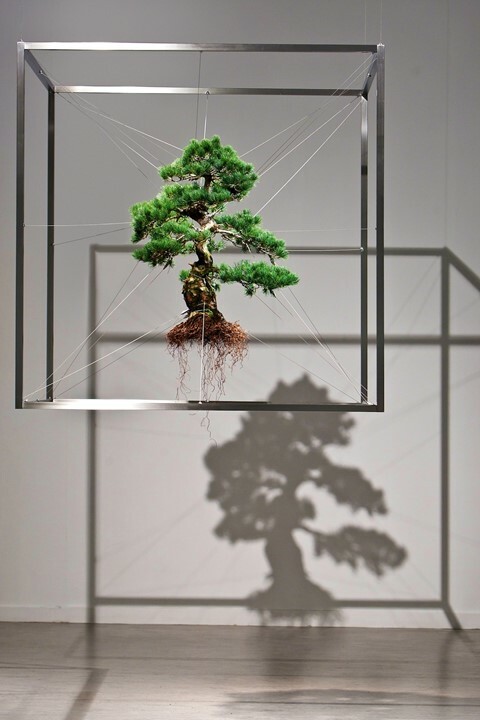 "'Shiki 1' – a pine tree hanging in mid-air inside a metal cube frame – is one of my signature works. It's the first piece in an experimental series that seeks to propose a new concept of beauty by confining a pine – a symbol of beauty in natural form – to a square frame, representing rules and regulations. Beauty is born out of the friction between nature and artifice. Attention is also drawn to the concept of life and death in a plant." "Peony season lasts for just a month in our garden, so I take extra care to savour each bloom as it comes out of the field. The gorgeous variety seen here was new to us and happened to bloom just as the first wild roses were opening and the last of the ranunculus were in flower. 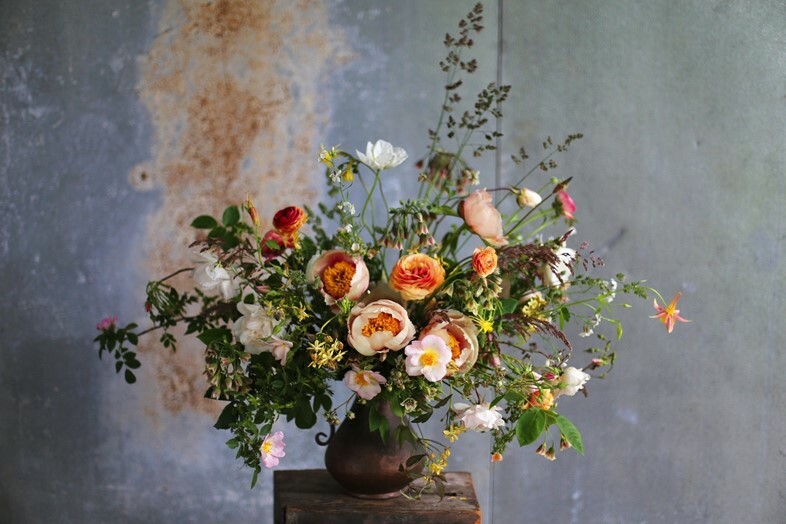 Combined with brodiaea, grasses and wild rose foliage, the bouquet captured the fleeting moment when so many treasured elements were peaking during the same window of time." "Floral still lifes from the Renaissance to the Baroque have always inspired me. The idea of many different flower forms, often from many different seasons, gathered together in a single floral work, is fascinating. During my training, we were asked to re-think and re-interpret the old scholars. I made a highly controversial tied arrangement that used about sixty different flower shapes and styles and no in-filling foliage. Nearly twenty years later this type of floral grouping is all the rage!" 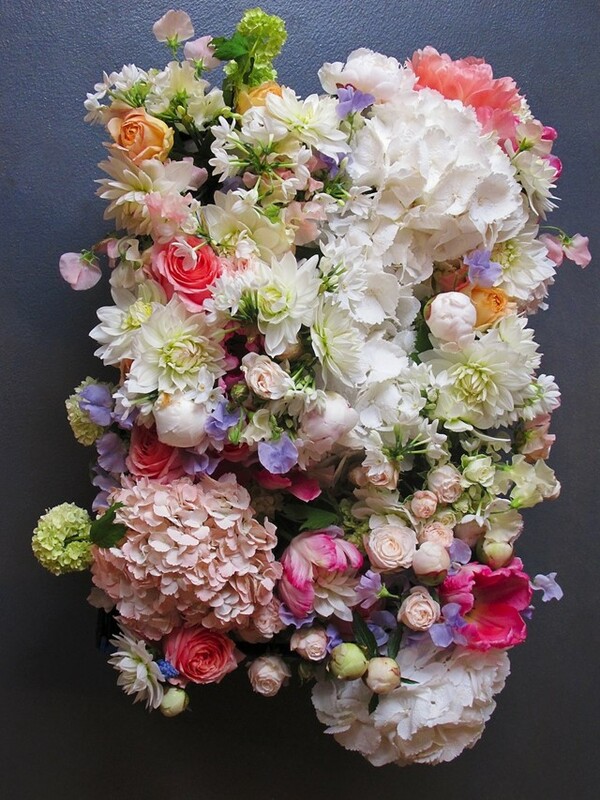 "For this bouquet, we felt inspired by the abundance of our orchard in spring. 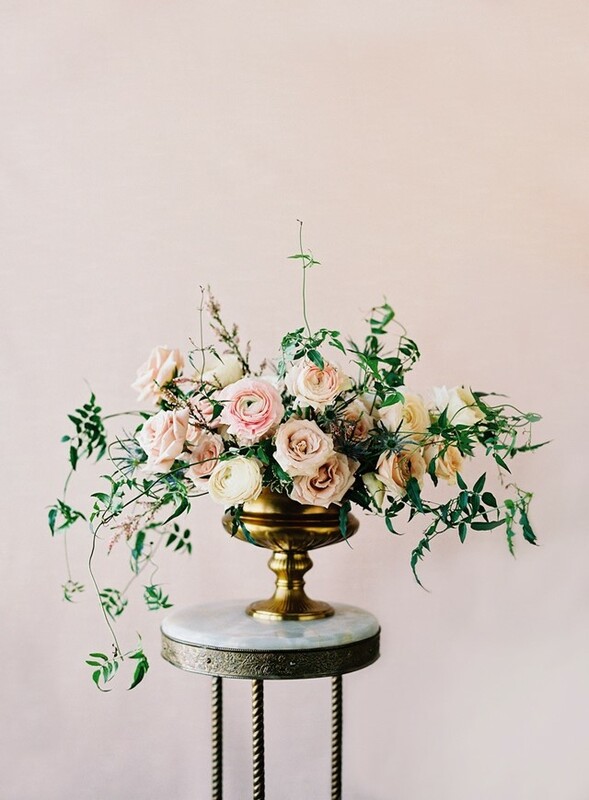 We cut ivory runner roses and mulberry leaves from the property and added local camellia and ranunculus blossoms for an unstructured 'master gardener' feel." "This is a contemporary classic McQueens look: a trio landscape that combines drama and romance. The flowers that feature are some of my all-time favourites: La Belle pink roses; pink hydrangeas and Sarah Bernhardt peonies." "The colours and softness of spring flowers are a sight for sore eyes after a long winter. Here I stripped back almost all of the branches to the tips to make tendrils, and worked with the natural curves of each branch to create a frame supporting the main body of the arrangement. 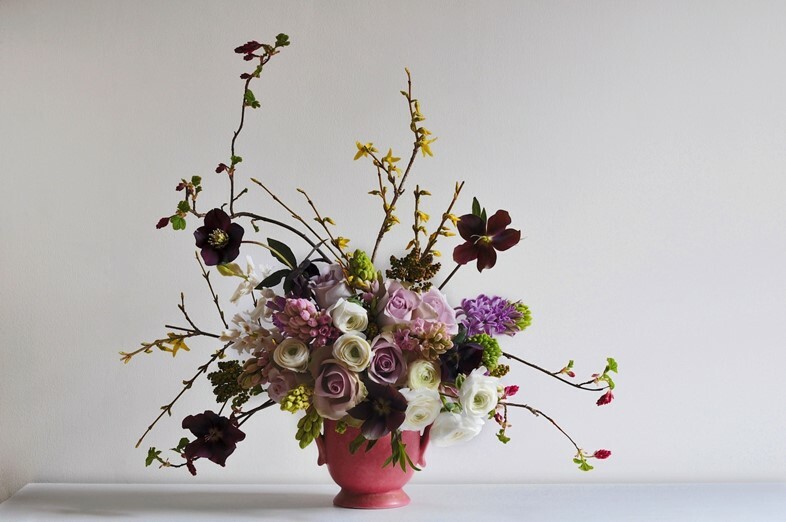 I used forsythia, flowering currant, hellebore, hyacinth, rose and ranunculus." "I like to bring nature into an urban environment, with its combination of hard concrete, glass, bricks, and 'trash' on the one hand and weeds, herbs, vegetables and of course wild flowers on the other. This mix holds great appeal for many urbanites, myself included." 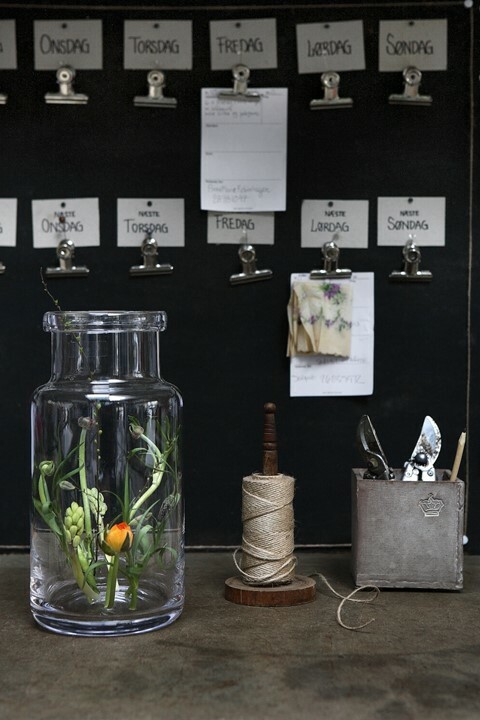 "Part of the joy of flower arranging is discovery. I like an arrangement to give an overall impression but to contain surprising and subtle elements that reveal themselves only after more careful consideration. Included here are heirloom hydrangeas, local hydrangeas, sedum and celosia." 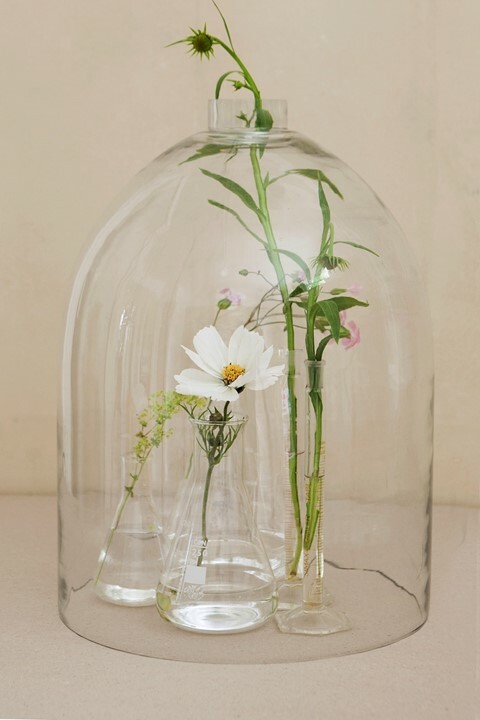 "In the 'Still Life of White Cosmos and Scabiosa in the Glasshouse', a bright simple flower is captured in all its pure beauty. The 'Dahlia Still Life' is a love affair between an object and a flower." 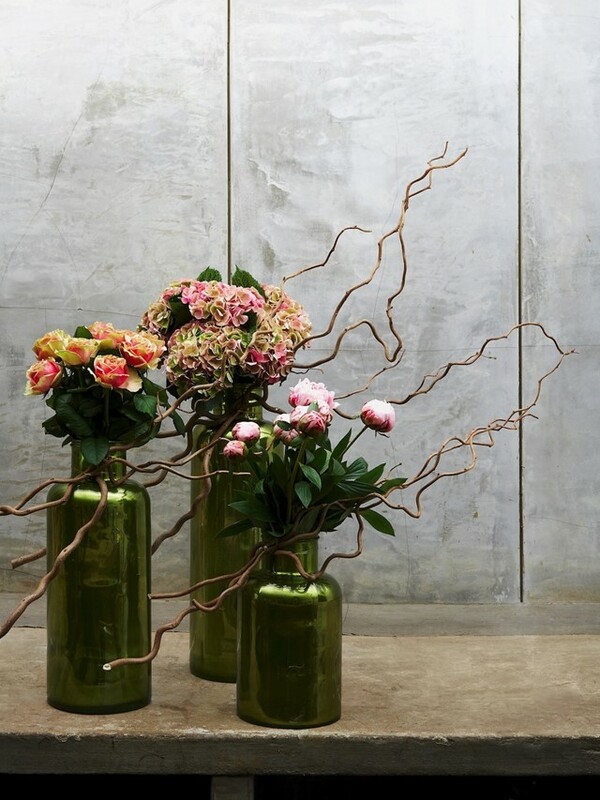 FLORAL CONTEMPORARY: The Renaissance of Flower Design by Olivier Dupon is out now, published by Thames & Hudson. For a celebration of fashion and plants, watch She Builds Domes in Air – Kristen McMenemey wearing Alexander McQueen in the delicately sinister world of Kew Gardens at night.